Hi! Thank you so much for taking such good care of us. Everything was amazing and my boss was reallllyyyy happy! Thank you for being so accommodating and great. Hands down best crawfish, I have ever had, everyone here was from New Orleans, so we are seasoned crawfish eaters. Came hot and cooked perfectly. Thank you so much. Will use and recommend you again. I seriously cannot say enough good things about NOLA Boils! They catered our wedding welcome party and we were truly blown away by them. We had our event at an almost all outdoor venue in the pouring rain and they still made magic happen. They had a tent and set up some tables and chairs, and boiled in the midst of flash floods for hours. Aside from the fact that we are eternally grateful they didn’t cancel on us and worked under very difficult conditions, the food was freaking awesome! We are both New Orleans locals and true crawfish lovers. The crawfish were perfectly cooked and seasoned, all the fixin’s were just right and the jambalaya they made was the best I’ve ever had! All our guests loved it! I’m a big fan of their food presentation, it was a really nice touch. We couldn’t be more thankful for these guys. They have a café on Metairie Road, so I suggest checking them out and if you’re in need of boilers for an event, look no further, they are the best! Thank you so much for a great event. From jump, NOLA Boils worked hard to impress. Whether it was the late-night call from the owner during jazz fest to make sure we had been confirmed and were all set, to the help getting the jazz trio worked out. I have hosted many catered events and as far away as I live, California, it was a breeze. On the day of, the team was professional and the food was great. It could not have run smoother. The crew packed up the leftovers and placed them in our fridge. We had them with eggs the morning after the wedding. Unfortunately the group (peaches restaurant) that catered the actual wedding were not as good. The chef walked around in a stained t-shirt and ripped stained shorts. And in the end he left all the food out on a table overnight so it went bad. The bride's comment the day after was - if she did it again I could choose the catering team. Thank you for making me look so good! Thank you for the catering job your company performed for us yesterday. Except for the bad timing of the rain, everything went very well. We were not able to eat under the tent because of the rain, but glad it was there for your guys to cook under. Not sure where we would have placed them to get the fish fried! We actually moved some of the tables and chairs into our lobby and your guys moved the food to our kitchen, so the event was a success. You were right about Ben being one of your top guys. Your guys were very professional and the food was delicious! Thanks again and we will definitely consider you for our catering jobs in the future. Jeremy Schreiber and NOLA Boils provided excellent catering services for our annual JV crawfish boil this year. Jeremy was very easy to communicate with and was knowledgeable about how much food and drink to provide for our event while we were in the planning stages. The day of the event, the NOLA Boils staff were great! They were on time and had everything set up and ready to go for the first guests. I highly recommend NOLA Boils for any future company (or personal) events! Thanks for helping us put together a great party for our employees! Great food and good service at the McPherson/Malone pre-wedding get together this past Friday! I did not get a chance to thank you after the shrimp boil but wanted to say how wonderful you and your team were. Everything looked and tasted amazing and I cannot stop thinking about the shrimp. It was AWESOME! You all have a great thing going and I appreciate the pride you take in your work. Everyone is singing your praises and truly got a taste of New Orleans! I just want to thank you so much for helping us put together our crawfish boil on Friday. Everyone had a great time and the food was awesome. Thank you so much for accommodating us, especially with our many changes to the menu and an alternate location at the last minute. I appreciate everything and would love to work with you again in the future! I can't say enough to recommend your service and work. You were incredibly responsive and thoughtful in terms of planning the menu, arranging for prompt delivery and keeping the train on the tracks. And the food was phenomenal – it was easy to taste how fresh the catch was, and the seasoning, particularly on the crawfish, was nothing short of addictive. I know that you went out of your way to find us Maryland guys some blue-clawed crabs, and they stood up to anything you'd find in Charm City. NOLA Boils catered our company crawfish boil this year for 250 people. From the decorations to the music to the cleanup, Jeremy and his team took meticulous care of every detail so that we didn’t have to worry about anything. There was something for everyone. The crawfish were perfectly cooked and seasoned. They provided hamburgers, hot dogs, and plenty of beverages as well. The food was ready on time and the service was friendly and courteous. 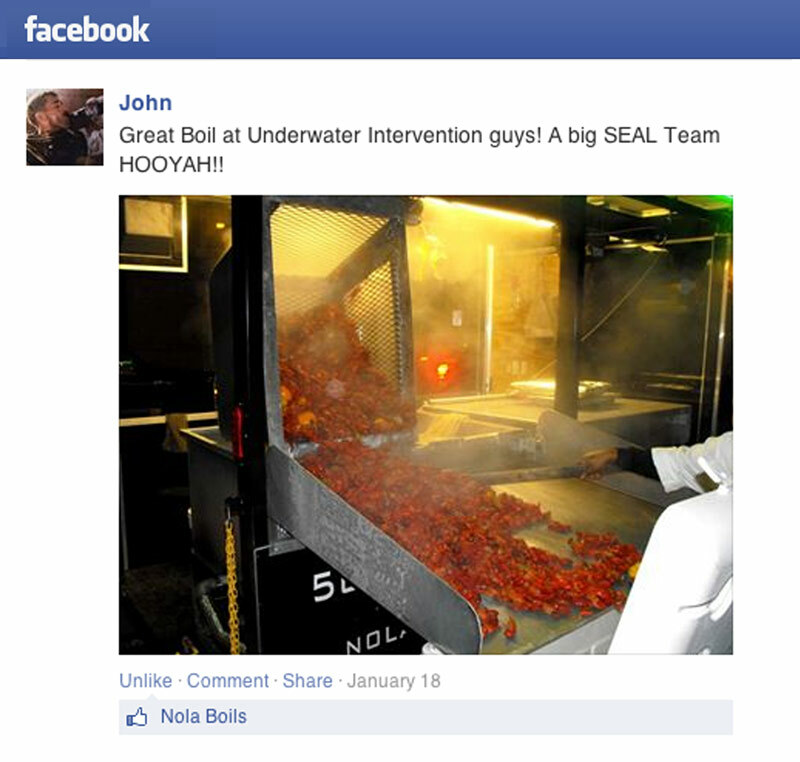 Everyone was full of compliments for NOLA Boils - we will be using them for years to come! 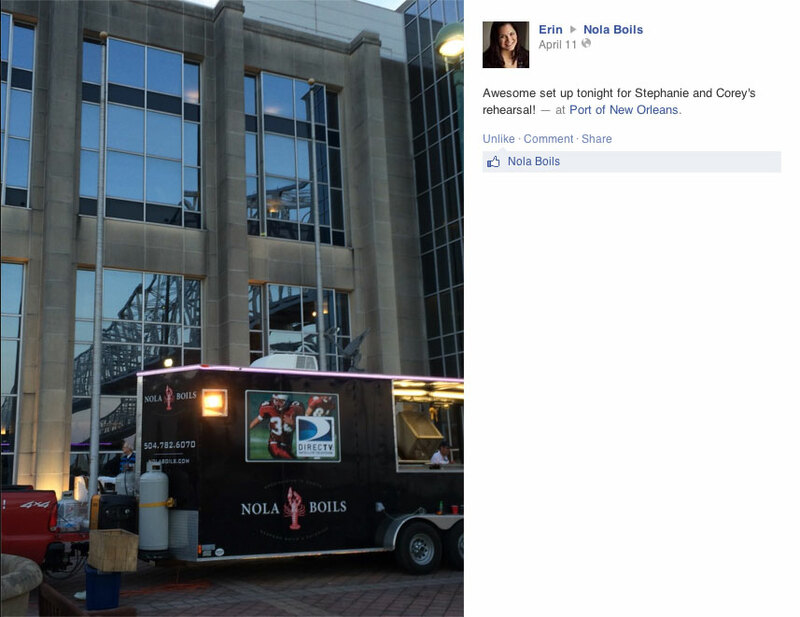 Thanks for the outstanding food, service and fun Nola Boils provided for my seventy five guests at our recent Saints game party! Everyone who attended raved about the incredible food (especially the char-broiled oysters, boiled shrimp and great desserts) you guys prepared! The bar you provided was a hit, and everyone left the party happy with full stomachs and a bit tipsy from your bartender’s home-made libations! Your staff was well-prepared, friendly and fun, and to be perfectly honest, my favorite aspect of the party was the fact that I had to do absolutely nothing to prepare for the party or clean-up afterwards! I can’t tell you how many parties I have had where I spent hours getting things ready in advance of the event and slaving to clean up a monumental mess afterwards. Your staff’s professional service was so impressive that I literally couldn’t even tell there was a party at my house an hour after it ended---and with me doing none of the work to make that happen. That itself was worth its weight in gold to me! The Saints won the game, but the true winners were all of the satisfied guests who were treated to a memorable experience thanks to your hard work and excellent food! I will absolutely call on Nola Boils again for future parties and will recommend your company to all of my friends! C. Perrin Rome, III, Rome, Arata, Baxley and Stelly, L.L.C. 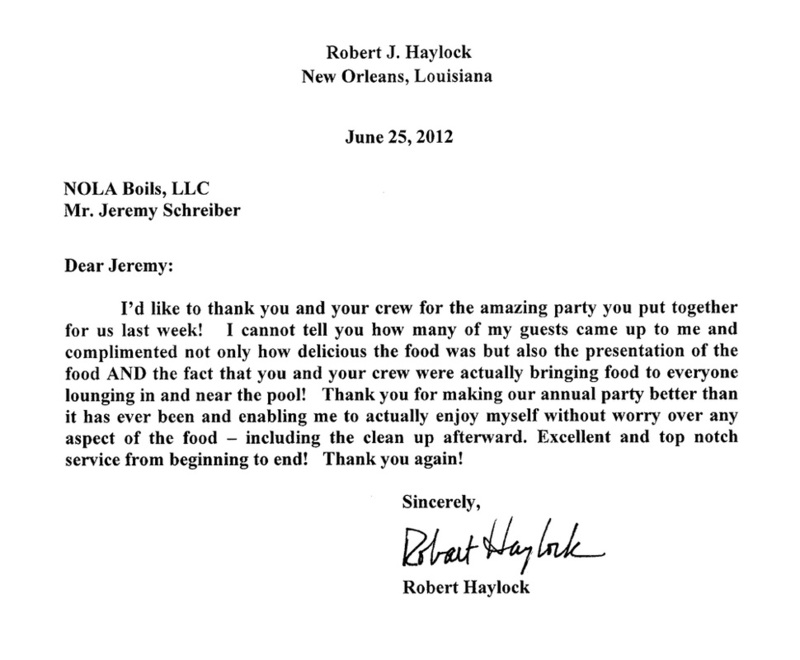 I had the great pleasure of working with Jeremy at Nola Boils in arranging a shrimp and crab boil in late July 2012. My group of 20 hungry folks came from all over the country for a weekend vacation in New Orleans and, given the fact that none of us are native New Orleanians and were not especially familiar with arranging a boil like this, Jeremy could not have been more helpful. He was exceptionally responsive as I made the arrangements remotely from Los Angeles and he was happy to answer any questions I had while making helpful suggestions based on his experience. I revised my order a couple of times and Jeremy never hesitated to update his quote and recommend new arrangements that would work best for my group. When the food arrived, everyone agreed that it was absolutely first-rate and Jeremy made things so easy for us. He even offered us suggestions for things to do in NOLA! In short, Jeremy and Nola Boils gets my highest recommendation. Look no further for great food and exceptional customer service. 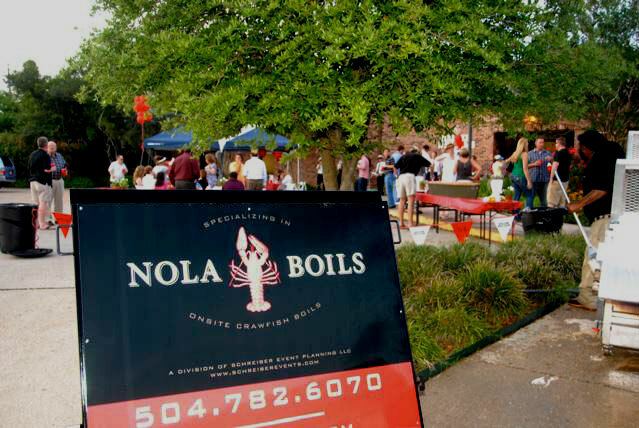 NOLA Boils did an outstanding job for Keller Williams Realty New Orleans Crayfish Boil this past spring. Everything was delicious and beautifully presented. Everyone agreed that we will make this an annual event with NOLA Boils! Your work on our event during the American Society of Trial Consultants was outstanding. I know we happened on your company in a time of great need and we are grateful that you came through for us. But, more than that, you exceeded our expectations for the event. You did more than just boil crawfish. You gave us complete management of the event. I had the pleasure of working with Nola Boils on June 1, 2012. This was a pre-wedding crawfish boil for local and out of town guests. What a success! I am a native New Orleanian but now live out of state. After contacting many companies I finally found Jeremy at NOLA BOILS. From my very first conversation with Jeremy, he was wonderful. My calls were always answered and returned in a timely manner. Their product and presentation were fantastic. Their prices were very reasonable. Our boil could not have been better. Jeremy and his staff came in and took over. From start to finish he did a wonderful job. If you are looking for someone to work with on your next occasion I would highly recommend Jeremy and NOLA BOILS. I would like to thank you & Ben for Sunday! My husband had a great 40th surprise birthday party. The crawfish were some of the best I have ever had. Y'all did a great job and I will highly recommend you to everyone!! We look forward to doing business with you again. I want to thank you for helping to make my parents’ 60th anniversary party a success. Everything was wonderful. The char-grilled oysters and shrimp remoulade were such a hit. Everyone loved them. Our guests ate non-stop and couldn't get enough of them. Your employees worked tirelessly from start to finish. I didn't do a thing. They setup, cooked and cleaned. They did it all with a smile on their face. They even hosed the porch before they left. I would have never known they were there. They probably left the space cleaner than when they started! Your company has made party-giving so easy for me. I can't tell you how impressed all of my guests were. So many people asked for your information. It really makes for a nice, unique and very New Orleans party. I can't imagine ever doing anything else! Everything was great and your crew was super helpful and nice, even doing extra things like changing out trash receptacles and taking out the garbage at the end of the event. Our facilities manager was ecstatic. We had a lot of positive feedback on the food, especially the crawfish. 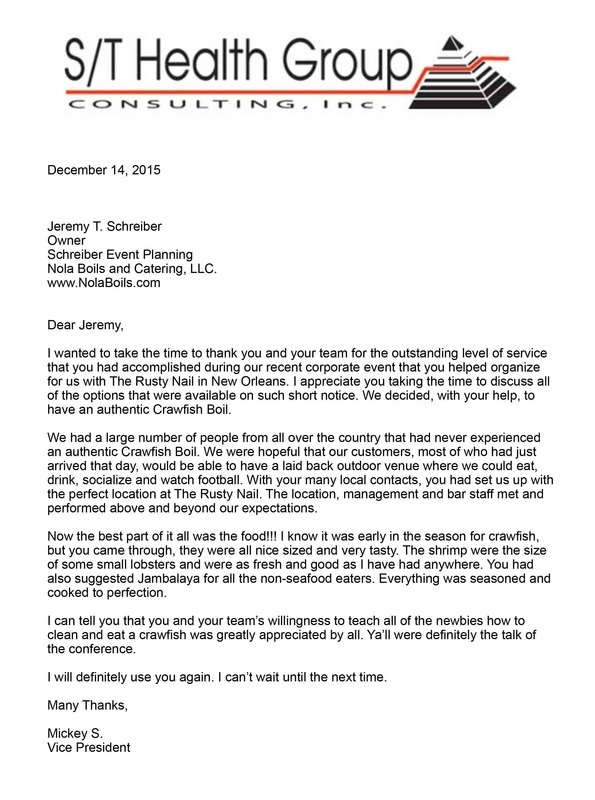 I used NOLA Boils Catering when my team came to New Orleans for a conference last month. From start to finish, Jeremy was great to work with and understood my vision perfectly. I went into planning this event without a lot of known details (location, menu, theme, etc.) and Jeremy helped me put it together with little to no guidance from me. We had a brief conversation over the phone about what I was picturing for this event and he did the rest. The event was a great success and everyone on my team really enjoyed it. We had great food, live entertainment, a fabulous venue and everyone really loved the police escorts! Thank you, Jeremy and NOLA Boils for helping make my job so easy and for making the event a success. You guys rock! Thank you so much for making our rehearsal party boil at The Canal Street Inn everything we wanted it to be. Even though it was a crazy weekend, with French Quarter Fest, you still managed to make it all go smoothly and made good on your promise, NO RAIN on Thursday...LOL. The Crawfish and Shrimp were a HUGE hit. All of our northern guests loved them and even the NOLA locals were raving on how good it was and seasoned just right, and that says ALOT. Everything from the boiled seafood to the boudin, jambalaya, meat pies, etc…It was all FABULOUS!!! Your presentation and decor were just icing on the cake. You and your staff could not have been any more accommodating and attentive both before and during the event. You were such a big help with the menu planning and so easy to work with. Anything I suggested, no problem. Y’all were very interactive with the guests and constantly checking to make sure that everything was to our liking. Best photo booth picture, you and my mom or you and your staff, I love it. I have planned numerous events and I have to say, it was such a pleasure to be able to actually enjoy the party knowing that you had it all under control. Highly Recommend NOLA Boils for any type of event. Two thumbs up from all the locals – I think the out-of-town guys' heads are going to explode – they've not tasted anything so good! Thanks! I cannot thank you and your team enough for the wonderful experience you created for our rehearsal dinner. It's been a month after the event and I am still getting comments from our guests about how amazing the crawfish were and how awesome your entertainment trailer was. My interactions with you leading up to and during the event were 100% top notch and you made this "once of a lifetime" event more than I imagined it would be. You exceeded my lofty expectations but more importantly, your staff, as an extension of you, couldn't have been more professional and courteous. The food, the service, the professionalism, and the price leave me with nothing but 5-stars across the board. This was a special day for me and my wife and we have you to thank for the wonderful memories we take away from it. Amazingly delicious and easy to deal with!!! Thanks and Happy Mardi Gras! Just wanted to tell you how WONDERFUL the crawfish were Friday night. By far the fattest, best seasoned crawfish I have ever had and I'm a true Cajun and know my crawfish :-) I had family coming in from all over for my mother’s funeral and they were just going crazy! Thanks again for the wonderful service and product. When I get time I will go on your website and post something good. I am also recommending you to everyone. I want to take this opportunity to thank you for a most excellent catering experience. Your people were professional and courteous. Your equipment was first class. The Crawfish and Jambalaya were delicious and prepared in a timely manner. Our guests had a great time and thoroughly enjoyed themselves. Many thanks again for an excellent experience. We will definitely call you for our future events and will gladly refer your company to our friends and associates. 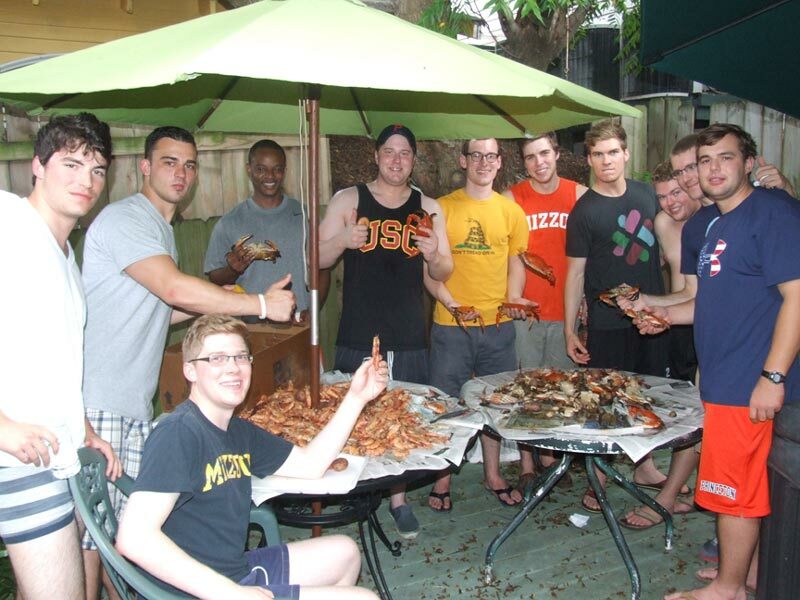 The Young Leadership Council (YLC) coordinated our first Annual Alumni Crawfish Boil this Spring. I thank Nola Boils and Catering for making it such a great success. You all showed up in advance with a very professional uniformed staff, set up our tent which included themed decorations. Finally, you served delicious hot boiled crawfish which you cooked onsite. It was a memorable experience we can’t wait to use Nola Boils and Catering again for our future events! I just wanted to send you a quick note to let you know that you and your staff truly made my office's Christmas dinner party a success! Scheduling my event was quick and easy and you arrived on time and prepared. The food was excellent, as was the service. We appreciate the quick clean-up. I will be using you in the future. Thank you, and please let me know if you ever need any references. 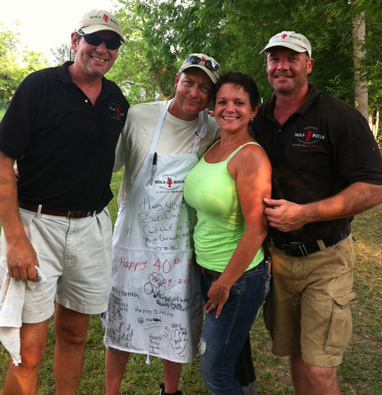 I wanted to thank you for the outstanding job NOLA Boils did in putting on our first ever company crawfish boil on May 4, 2012. The crawfish, corn, potatoes and sausage were outstanding, and your company’s boiling skills, presentation and service were phenomenal. More importantly, the clean-up was excellent. I thank you for your professionalism. We had long talked about having a company crawfish boil, but just hadn’t come upon the right time. Now that we have done one, and more importantly, that you have done it so well, we will have to make it an annual event. I will contact you in early January to set up our 2013 event. Unfortunately or fortunately, depending on how you look at it, because of the success of this year’s event, we will have to increase the number for next year. I do hope to move it up in April, but will have to wait until January to see what my travel schedule for DU is, and what our school schedule is for our employees’ school age children. Again, I thank you for making this crawfish boil a huge success. My company organized a conference that involved a need for catering at 3 separate locations on 2 different days with different needs at each location. From catering only, to catering and table and chair set up etc., they handled everything beautifully. From the very beginning they were able to understand my needs, provide everything we needed for each one and executed everything in an extremely professional manner. Even their presentation was tasteful, beautiful, and beyond our expectations. I cannot recommend Nola Boils and Schreiber Event Planning highly enough. I will continue to work with them for future events and rest assured they will make my job much easier for doing so! Thanks for doing such a fabulous job with our crawfish boil! Everything was perfect, from the crawfish to the service! They were seasoned just right. We really enjoyed everything – especially the full service that you offer. All we had to do was sit and enjoy the mudbugs. We will use you and again in the future and recommend you to our colleagues in the area. Thank you for making our first ever Employee Spring Fling Crawfish Boil a success! I appreciate you and your staff for all your efforts from start to finish. You informed me of everything, leaving nothing to question as far as the process, food, and fees. Your display set up was fun and professional and, our staff was happy to have full service by you so they could relax and enjoy the day. Also, thank you for all your guidance in developing the event. It could not have gone any smoother. We plan to have another employee appreciation day this fall and, since your services offer so much more than just boiling crawfish, we definately will be calling on you! I have no doubt it will be another success!! Thank you Jeremy and NOLA Boils - you are great!! Thanks to NOLA Boils, our graduation party was a great success. The employees were both accommodating and friendly. They arrived on time, set up a beautiful presentation and served delicious hot crawfish throughout the evening. Everyone was impressed with the crawfish, stating it was the best they have ever had. 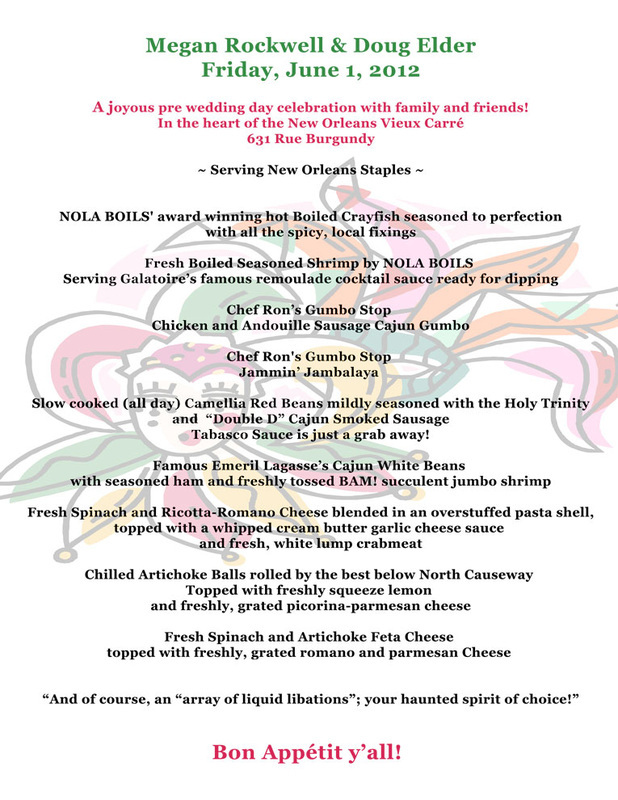 We will certainly recommend NOLA Boils to our family and friends for any future events. 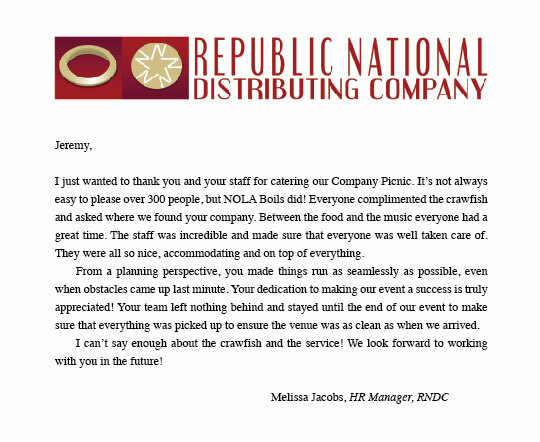 Thank you for the great job that you and your team did for our crawfish boil on April 13th. As you know, this was the sixth year in a row that we have thrown this party in appreciation of customers, and by all accounts, it was the best one yet. Not only were the crawfish seasoned deliciously, but I was very impressed by how your team was able to consistently serve them hot over the course of the entire party. Equally as impressive as the crawfish, was the customer service that you provided. This was without question the most effortless crawfish boil that I have ever been a part of, and I have NOLA Boils to thank. We will definitely be calling you to handle our party again next year. My mouth is watering just thinking about it! Andrew Treuting, Stewart Title of Louisiana, Inc. Thanks for doing such a fabulous job with our crawfish boil. The crawfish were spiced just right, the presentation was unique, and best of all, we got to just sit back and enjoy the evening. You and your assistants tended to our needs without getting in the way. We continue to receive compliments from our guests; we give you guys the credit. 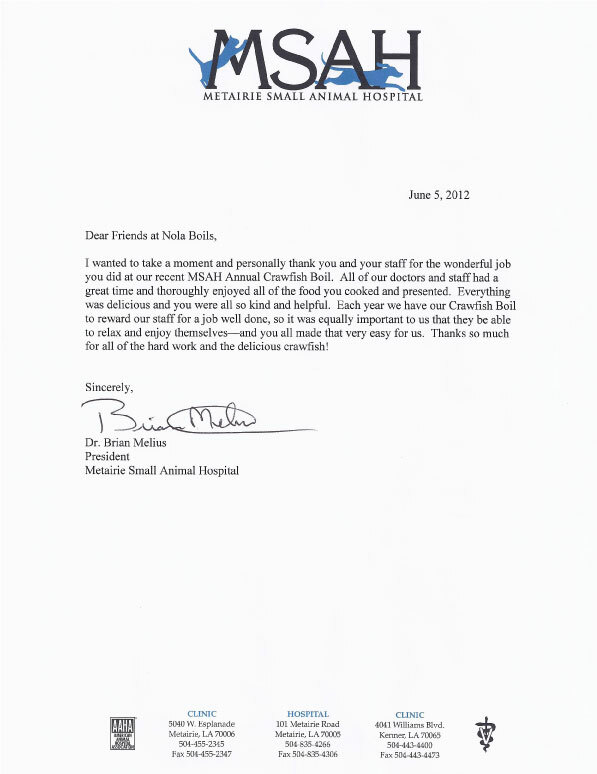 We will continue to recommend NOLA Boils!